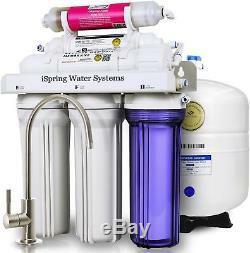 ISpring RCC7AK 6-Stage 75 GPD Residential Under-Sink RO Water System With WQA. This iSpring 6-stage reverse osmosis water filter is built around the idea that nothing is more important than clean water. The unique design pushes water through a series of filters and membranes to deliver safe and odor-free water with each glass. 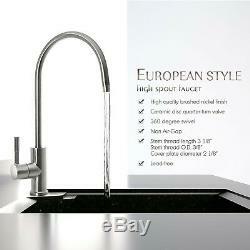 The set also comes with a designer faucet, so you can completely upgrade your existing kitchen faucet. 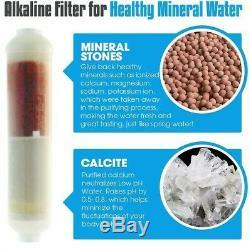 Restores natural mineral balance to deliver great tasting mineral water. 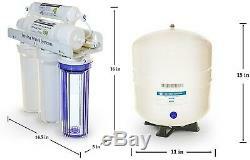 Prevents up to 99 percent of over 1,000 pollutants from entering your water for better health. 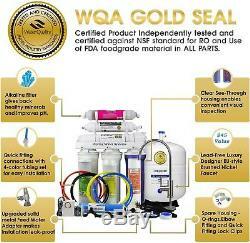 WQA Gold Seal certified for superior performance and quality materials. Includes the gradient sediment filter, fine coconut carbon, and 0.0001 micron RO membrane. 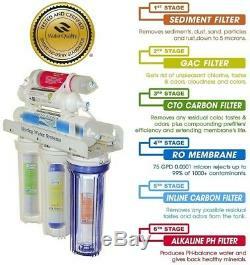 First-stage filter features a 5 micron 10-inch high-capacity polypropylene sediment filter to remove fine particles. Second-stage filter features a 5-micron 10-inch granular activated carbon (GAC) filter to remove unpleasant tastes and odors. Third-stage filter has a 5-micron 10-inch carbon block filter to remove residual color, tastes and odors. Fourth-stage filter has a 0.0001-micron high-rejection TFC reverse osmosis membrane. Fifth-stage filter delivers a 1-micron 10-inch total polishing inline carbon filter. 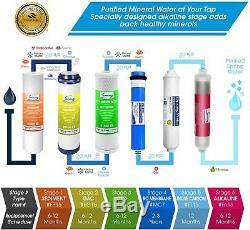 Sixth-stage filter includes an alkaline pH filter to balance the pH. Includes the machine head and premium 3.2 gallon pressurized faucet tank. Faucet is lead-free with a long goose neck design. Set comes with tank valve, feed water adapter, drain saddle, teflon tape, two W wrenches, three spare O-rings, two spare elbow fittings, and user manuals. 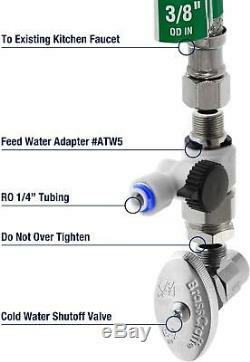 Pre-installed automatic shut-off valve and check valve work together to shut off the system once the tank fills. Made from plastic and metal for durability. Dimensions: 15 inches wide x 8 inches deep x 18 inches high. Material: Assembly Hardware, Metal, Plastic Type: Water Filtration System Assembly: Assembly Required Filtration Stages: 6 Primary Filtration Type: Carbon Set Includes: 1 Piece. At this time we are unable to provide the option to choose your carrier of choice. At Toscano Home Decor we strive to provide our customers with quality products at the best prices possible. Our team conducts business with a spirit of excellence and integrity. We make all efforts to give each customer a level of service that they will never forget, making them want to come back for more. If you are looking for the latest style and fashion for your home this is the store for you. At Toscano Home Decor we offer decor and furnishings for the living room, dining room, bedroom, bath, kitchen, office, entryway, backyard and much more. We look forward to conducting business with you. The item "ISpring RCC7AK 6-Stage 75 GPD Residential Under-Sink RO Water System With WQA" is in sale since Saturday, February 17, 2018. This item is in the category "Home & Garden\Kitchen, Dining & Bar\Small Kitchen Appliances\Water Purification\Water Filters". The seller is "toscano-home-decor" and is located in New York, New York. This item can be shipped to United States, Canada, United Kingdom, Denmark, Romania, Slovakia, Bulgaria, Czech republic, Finland, Hungary, Latvia, Lithuania, Malta, Estonia, Australia, Greece, Portugal, Cyprus, Slovenia, Japan, China, Sweden, South Korea, Indonesia, Taiwan, South africa, Thailand, Belgium, France, Hong Kong, Ireland, Netherlands, Poland, Spain, Italy, Germany, Austria, Bahamas, Israel, Mexico, New Zealand, Philippines, Singapore, Switzerland, Norway, Saudi arabia, Ukraine, United arab emirates, Qatar, Kuwait, Bahrain, Croatia, Malaysia, Brazil, Chile, Colombia, Costa rica, Panama, Trinidad and tobago, Guatemala, Honduras, Jamaica, Viet nam, Uruguay, Antigua and barbuda, Aruba, Belize, Dominica, Grenada, Saint kitts and nevis, Saint lucia, Turks and caicos islands, Barbados, Bangladesh, Bermuda, Brunei darussalam, Bolivia, Egypt, French guiana, Gibraltar, Guadeloupe, Iceland, Jordan, Cambodia, Cayman islands, Sri lanka, Luxembourg, Maldives, Nicaragua, Oman, Peru, Pakistan, Paraguay.